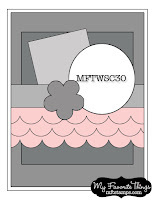 It's week #30 for My Favorite Things Wednesday Sketch Challenge - check it out HERE. Love this new image which I paper pieced and colored with Copics. 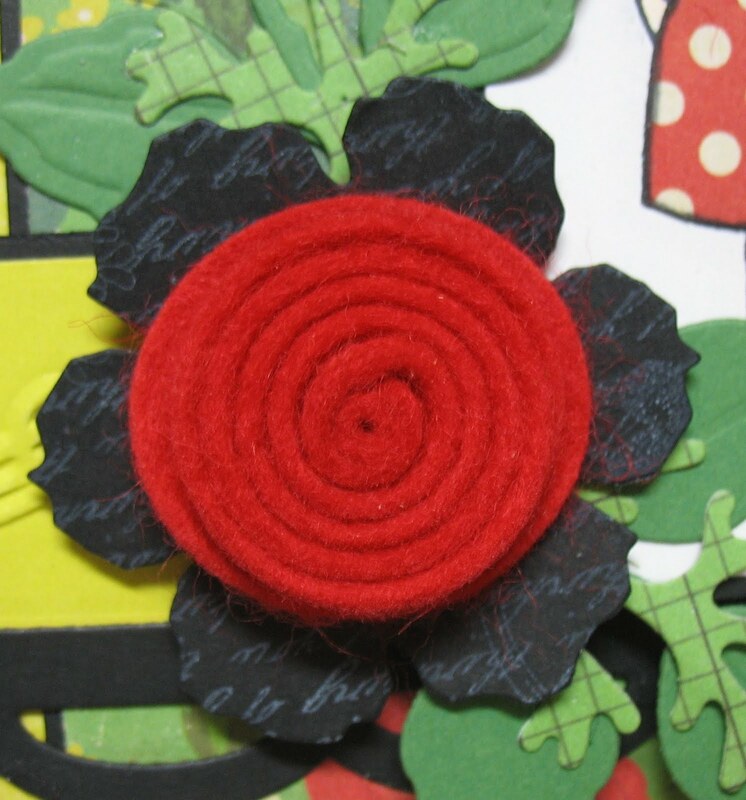 I added Nut Brown Flower Soft to the centers of the sunflowers. This will be a quick post...off to the hairdressers for a long overdue appointment! 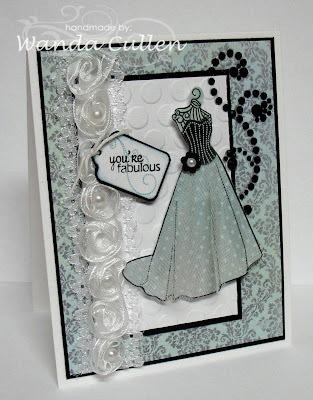 ACCESSORIES: Lacey circle Die-namic (PTI), Large scallop border Die-namic (PTI), MS twill tape, Flower Soft, Copics, Spiral border punch (SU). 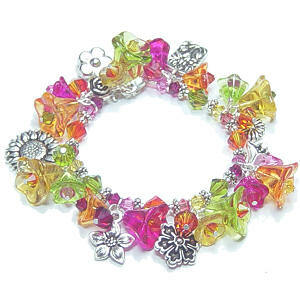 ACCESSORIES: Ribbon trim (? 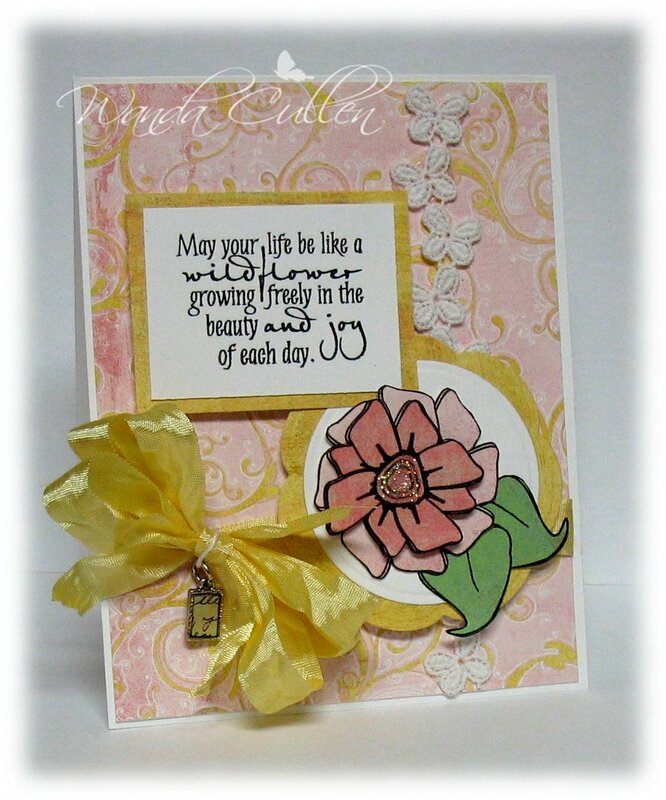 source), Tiny tag die by PTI, Tiny flower punch from the dollar bin at Michael's, Adhesive bling, Tulle, Large dotted EF. Good Monday morning friends! 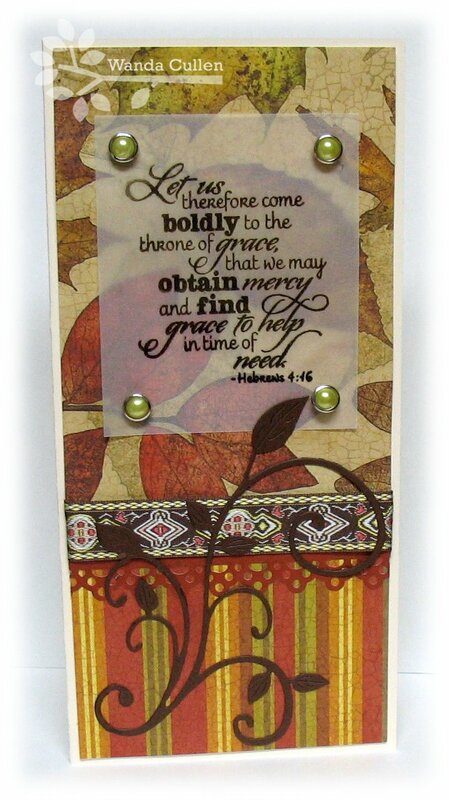 Sun is out, humidity is down and we were blessed by a wonderful rain last PM...I'm off today...I have some extra stamping time...woo-hoo! 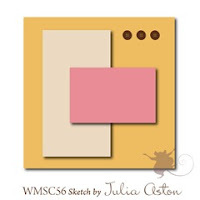 I love Stephanie Kraft's Mojo Monday sketch and went with a 4 1/4" square card this time. 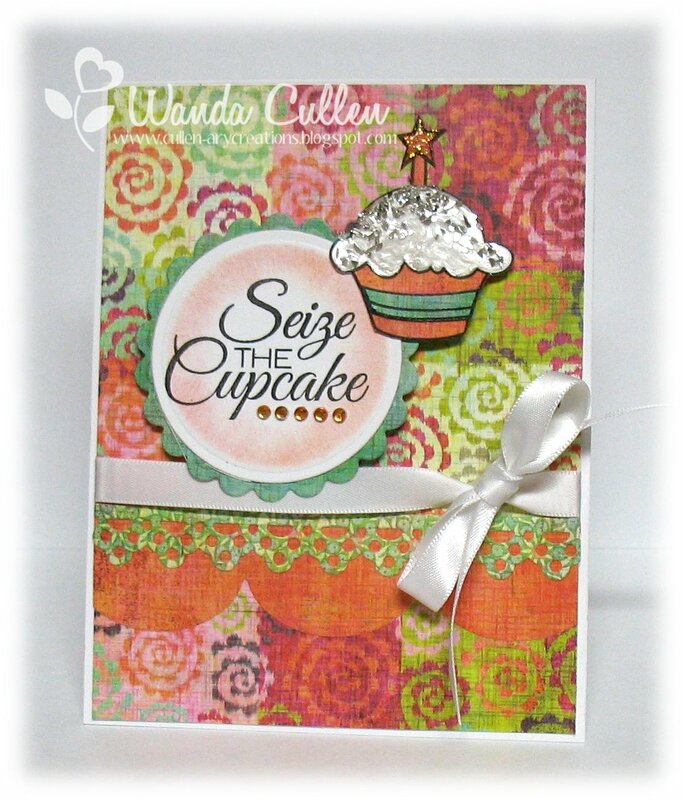 It's no secret I'm a big fan of Verve stamps and this card uses stamps from FOUR different sets! 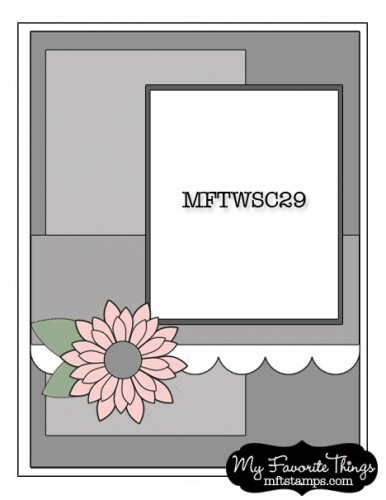 How cool is that to be able to custom design a card from so many sets?! 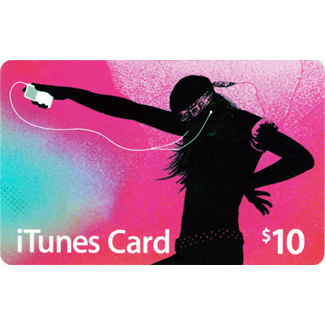 A sweet couple from church has a 50th wedding anniversary and I plan to give this to them with a gift card tucked inside. I sponged the edges with Antique Linen distress ink, except for the Purely Pomegranate ink sponged on the flower petals. 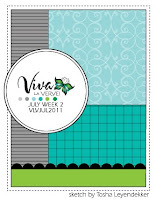 The paper is a bargain find at TJ Maxx - $1.99 for K&Co's Mega Tag pad! Another woo-hoo! 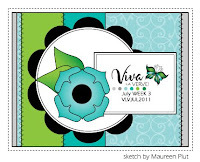 STAMPS: Hope Blooms (flowers), Kindred Spirits (oval fleur de lis frame), Blue Skies (notebook page & flourish), Love Notes (sentiment) - all by Verve. PAPER: Vintage Cream, New Leaf, Mega Tag pad (K&Co). INK: Versafine Onyx Black, Purely Pomegranate, Antique Linen distress ink (Tim Holtz). ACCESSORIES: Brads, Silver pearls, Satin ribbon, PTI mini tag die, MS fern punch, Oval Nestie, Sponge, Crystal Effects. 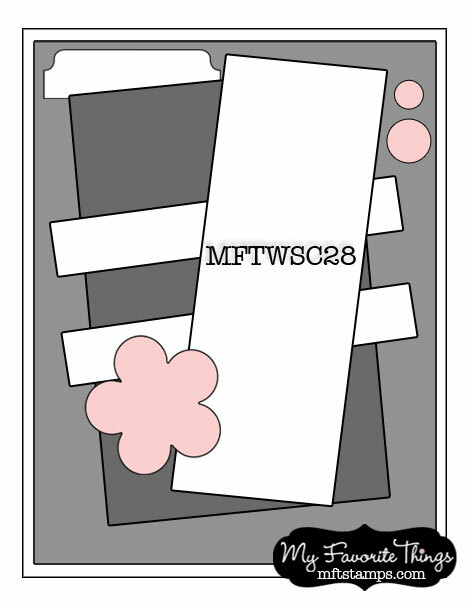 It's really late...but couldn't resist making a quick card for Jen's CAS tag card challenge on SCS after getting home from work at 11 PM! 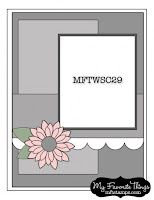 I masked a frame image from Waltzingmouse Stamps Very Vintage Labels #4 set, cut it out and layered a mini kraft tag by Maya Road. I stamped a tiny sentiment from Verve's new Small Phrases set and added a BoBunny clock brad & a prima. Some baker's twine ties it together. Time to hit the bed...nite all! It's a sweltering Friday...to go up to 101 degrees! What better way to stay cool than to be in my air-conditioned stamp room! 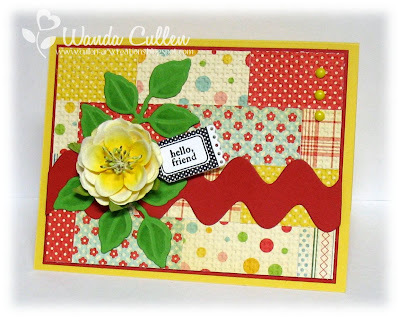 I made this card for Verve's July Diva Dare...Sentimental About Paper. 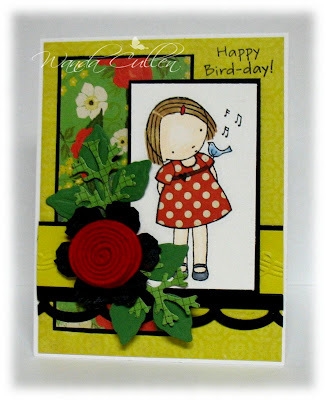 We are challenged to use those patterned papers and stamp only a sentiment. Well, my sentiment is only one word, but when it's a word like "hugs"...what else needs said? 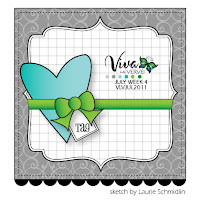 :-) This also uses Laurie's wonderful sketch in the Viva la Verve challenge...LOVE it! 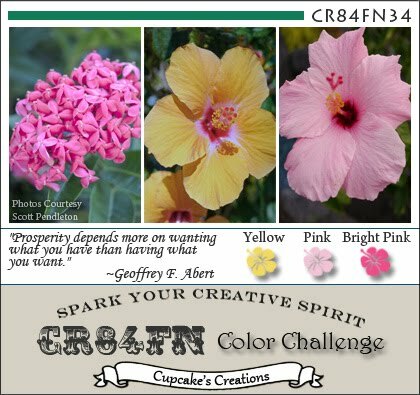 I'm also entering this into the CCEE Stampers challenge to "send a hug" or a card of encouragement. I went with a quilted look by using a square punch to punch out 9 squares, zigzag stitching then cutting with a Labels Sixteen Nestie. The heart was cut with a Verve die, run through a crimper, edges sponged with Chocolate Chip ink, then some white Stazon ink was swiped over it. 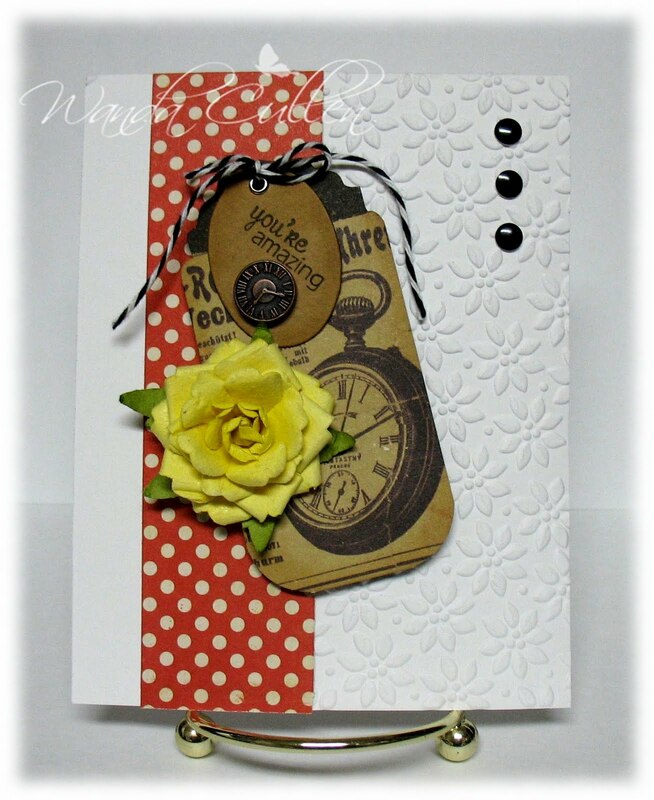 The 5" card base is Vintage Cream by PTI and all other papers are from the Linen Closet mat stack by DCWV. 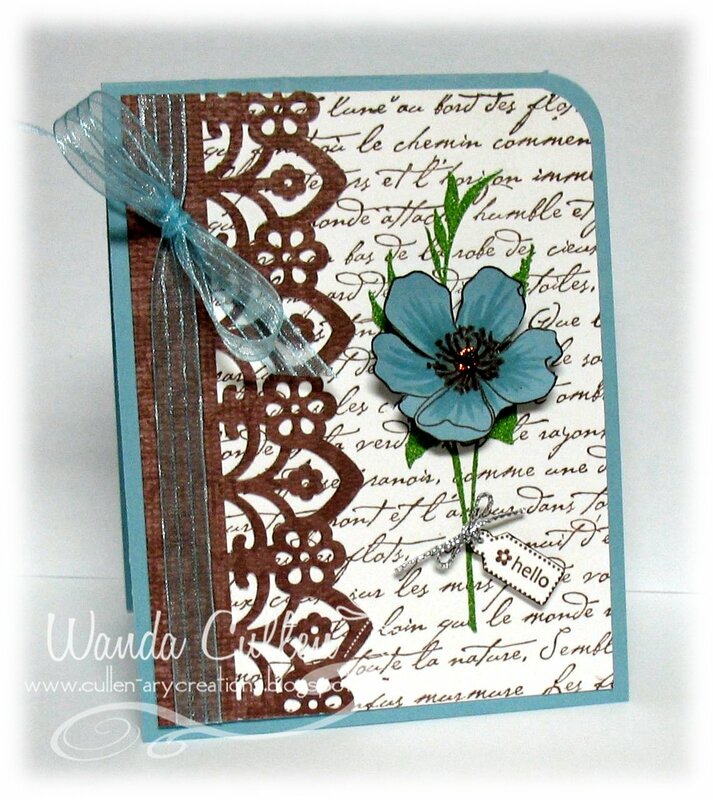 Baja Breeze seam binding and a Kaisercraft paper bloom finish it off. Stay cool my friends! I'm off to eat lunch with my middle son. After getting some new Waltzingmouse stamps in the mail today, I just couldn't resist playing along with the Sketch Challenge this week...a great, simple layout by fellow Paper Doll, Julia Aston! 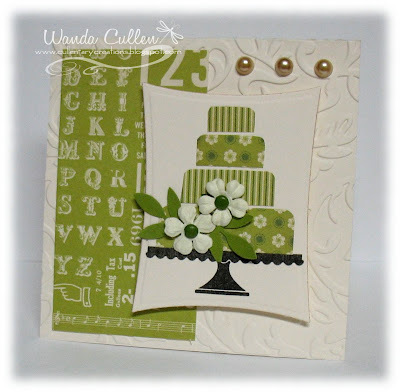 I paper pieced the cake and added a couple of tiny primas and some punched leaves. The 4" square base was embossed using a Victorian EF by CB. 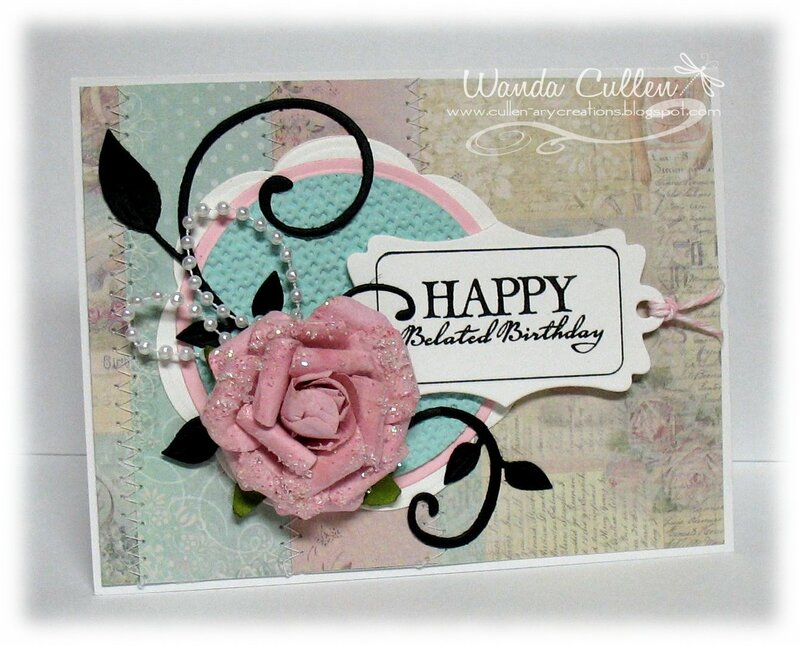 So fun and quick to create...a perfect little birthday card to tuck in with a gift! This is also for Hannah's fun WT Challenge to use metal on a card...those 2 tiny brads are metal, so I'm thinking this qualifies for that as well! ACCESSORIES: Victorian EF, Wonky Rectangle Nestie, Kaiser pearls, Primas, Brads, Frond punch by MS.
Steph has a hint of autumn for us with this country road scene and I love the vivid fall hues! 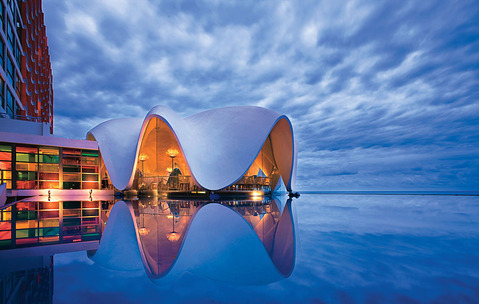 This photo is for the For Your Inspiration challenge...hope you take the time to play along with us and give us your interpretation! 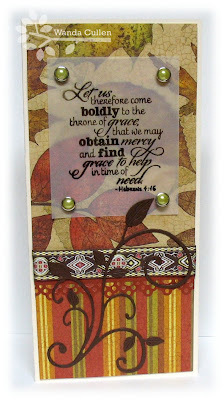 I wanted to let the leaf design shine through, so stamped the sentiment on vellum and attached it with brads. Some embroidered trim, a die cut border and a large leafy flourish finish this off. What did I use? 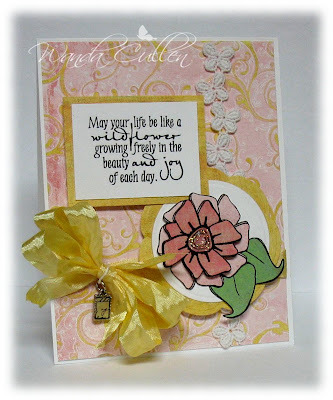 ACCESSORIES: Leafy Flourish die by Cheery Lynn Designs, Doily lace Die-namic, Embroidered trim, Brads. 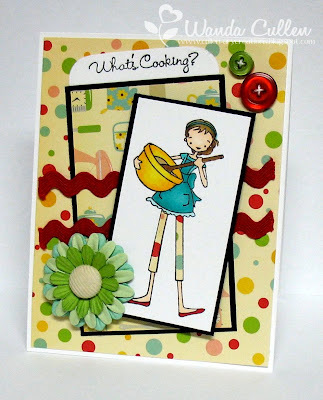 This is a CAS card for the Teapot Tuesday challenge on SCS and it's also for the Color Throwdown challenge to use a rainbow of colors this week. 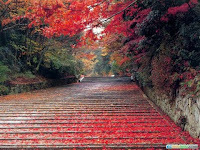 The destination is for the sake of Jake...a 13 y.o. boy from Myersville, MD, who has had multiple surgeries since birth and faces a summer of recuperation once again! He loves jokes and we've been challenged to bring a smile to Jake's face! 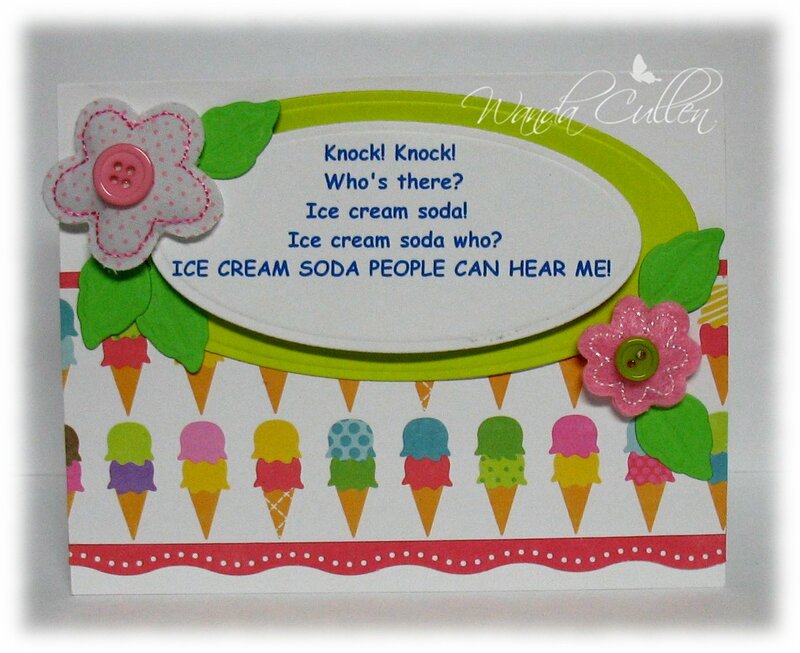 I went with a rainbow of ice cream cones and included this knock, knock joke for him. ACCESSORIES: Puffies embellishments, Foliage die by Spellbinders, Long Oval Nesties, EK Success border punch. 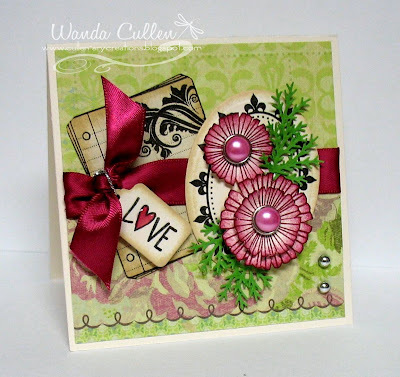 ACCESSORIES: Foliage dies by Spellbinders, Rolled flower Die-namic (MFT), Tattered Florals die (Tim Holtz), Open scallop border Die-namic (MFT), CB EF, Copics. ACCESSORIES: Corner chomper, Sheer ribbon (Michael's), Tiny tag punch (SU), Silver cord, Garden Gate deep edge punch by MS, Wild Wasabi EP. 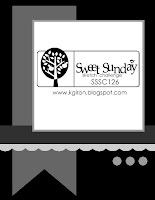 The Shabby Tea Room - be inspired by the picture & add a charm. 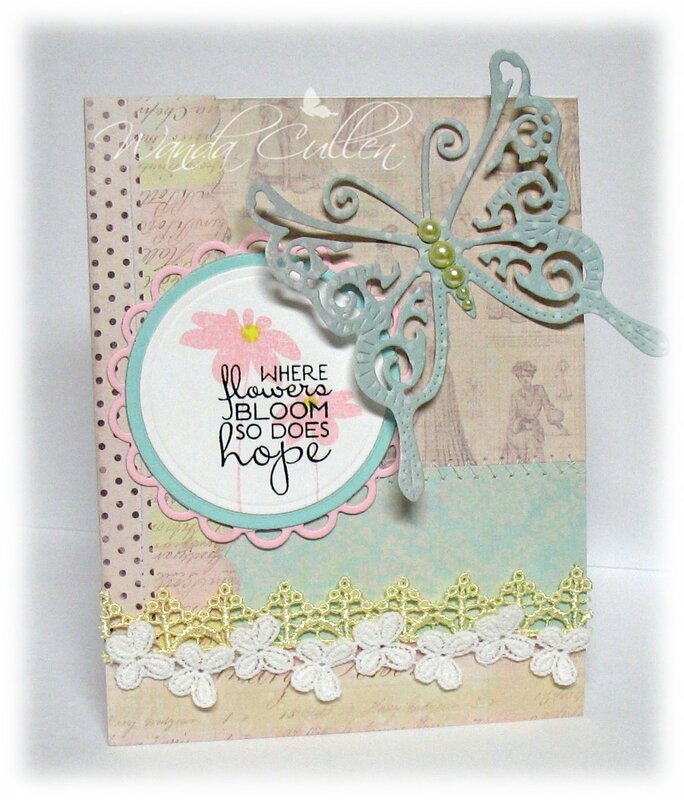 ACCESSORIES: Butterfly trim, Blossom & Circle Nestie, MS Seam Binding, Charm. 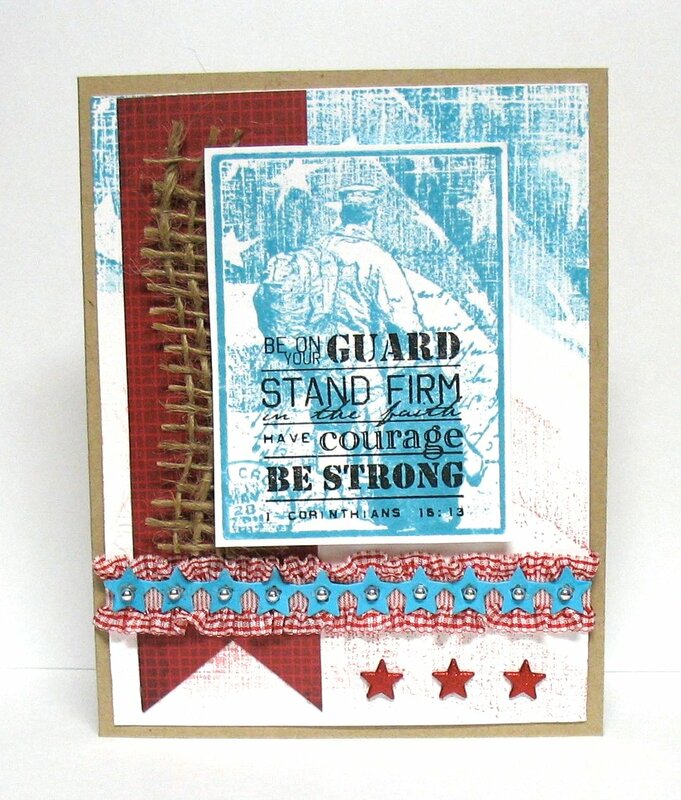 I'm loving these new images by Dina Kowal for ODBD...perfect for sending to service men and women! 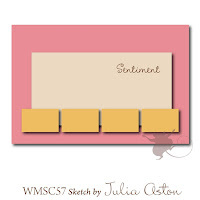 Today's featured stamper on SCS is teristampsalot & I thoroughly enjoyed browsing her gallery. I was inspired by the color combo she used a couple of times, so went with the turquoise, red and kraft for this card. I used the layout for Karen Giron's Sweet Sunday Sketch Challenge and am entering this into ODBD's Shining Light Challenge to take inspiration from this phrase: "You're a grand old flag, you're a highflying flag". 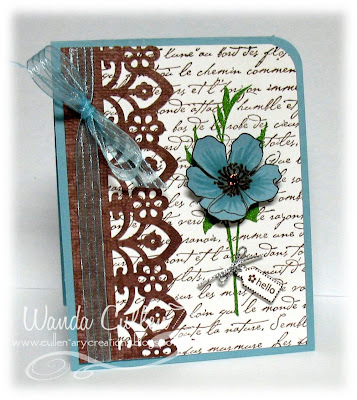 I inked the BG stamp using Tim Holtz' Broken China & Fired Brick distress inks. The soldier image was also inked with China Clay and the sentiment was stamped in black. 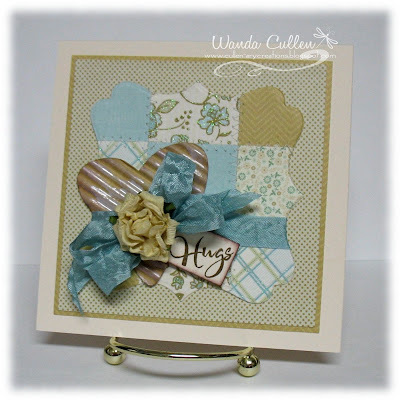 Because I added the burlap element, I used kraft for the card base. I layered the star die border over the ruffled ribbon and added silver pearls. Thanks for visiting...hope you take time to comment and let me know what you think! ACCESSORIES: Star Die-namics border (MFT), Burlap, Ribbon, Kaiser silver pearls, Glitter star brads. 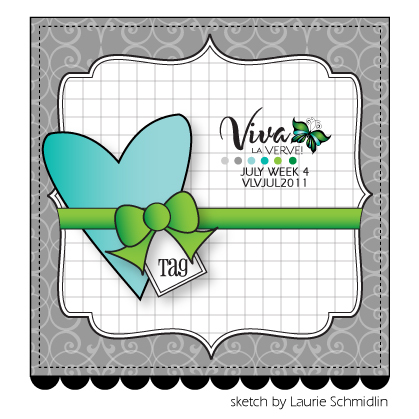 This is the for the second Viva la Verve Challenge for July...a great sketch by the diva Tosh! Since I still had my MF papers on my desk, I went with the same color scheme as my earlier card today. It's pretty self explanatory, so I'll just give you my enabler's list - lol! ACCESSORIES: Exotic Butterfly medium #1 by Cheery Lynn Designs, Kaiser pearls, Circle & Lacey Circle Nesties, Lace trim. 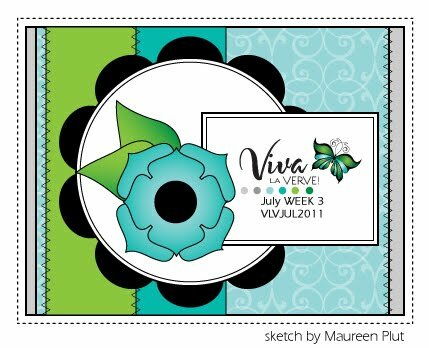 It's time to catch up with July's Viva la Verve challenges! 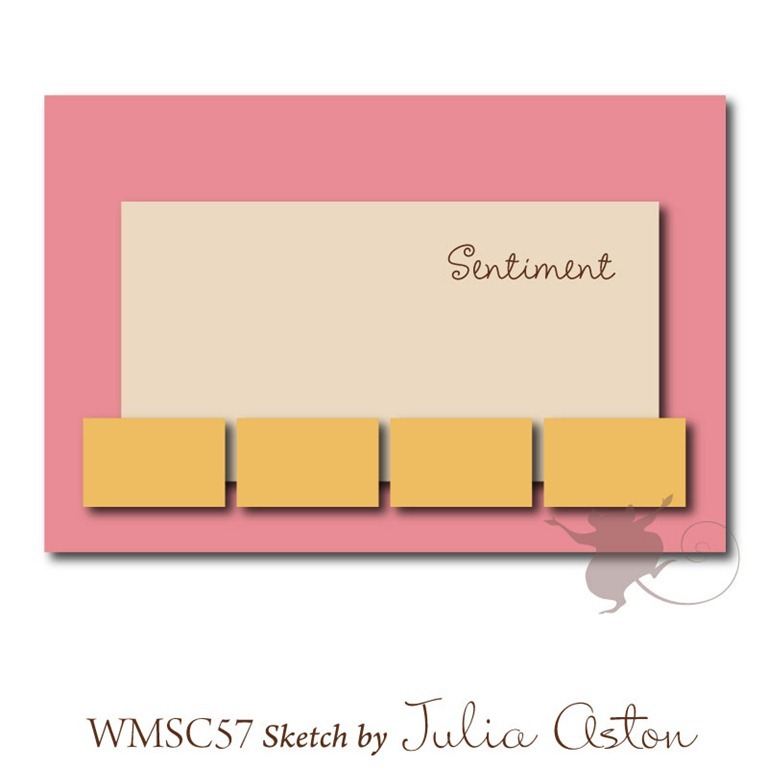 This week Maureen has a great sketch for us...I went all soft with pastels using some new Melissa Frances DP. This card is also being entered into the Get Your Diva On Challenge in the Verve forum where we were to be inspired by a gift card. I liked the colors in this iTunes card -pink & aqua with a pop of black - and used the muted shades to fit my DP. I zigzagged the panels, embossed the circle Nestie using the square lattice EF by SU, and added pearl loops along with a die cut flourish by Cheery Lynn Designs - LOVE this die! It's my w/e off after a busy 5 day stretch at work, so have lots to catch up on around the house! Hoping to catch some more stamping time tomorrow...have a good day! ACCESSORIES: Prima, Grommet tag by Spellbinders, Baker's twine, Blossom & Circle Nesties, Cheery Lynn Designs flourish die, Square lattice EF by SU, Pearl ribbon. Vacations are good, but it's always good to get home and back into a routine again! Also good to get back into your own bed again - lol! 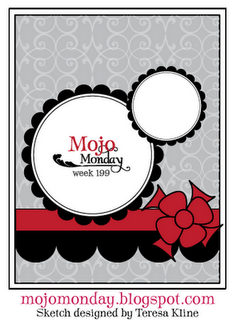 I created a quick card for the Mojo Monday sketch challenge and this week it's a layout by the talented Teresa! I saw the 2 circles and immediately went to this birthday set by Verve. The cupcake was paper pieced ,then White Opal liquid pearls were added for "icing". Some silver glass glitter "sprinkles" and Diamond Stickles to the star finish this off. ACCESSORIES: Doily border and Large scallop Die-namics, Satin ribbon, Circle & Scallop circle Nesties, White Opal Liquid Pearls, Diamond Stickles, Rhinestones. 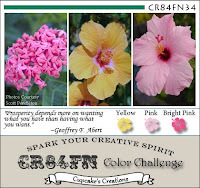 It's time for another inspiration photo on the For Your Inspiration challenge blog! I was immediately drawn to 2 elements: the curvy lines of the building and the multi-colored rectangles of the glass panels. I created a patchwork of multi-colored 1" x 2" rectangles for the card BG and then embossed it using the square lattice EF. The rickrack border imitates the curvy lines of the architecture. I'd love to see how you interpret the picture, so join in the fun and create something...doesn't have to be a card. It can be another craft medium if you choose. 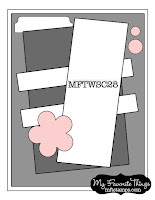 ACCESSORIES: Square lattice EF, Foliage die (Spellbinders), Prima, Tiny tags die (PTI), Rickrack Die-namic (MFT), Brads.